Basically, you sign up, wait for them to approve you, and then you are free to pick a book. Once you review it and post that review on your blog and at least one other site (like Amazon) you can pick another book. No, you don't have to give them glowing reviews--you can say anything you want as long as you're not rude. Apparently, though, they don't hold their authors to the same standard. The smile, however, only lasted until I opened the book. I'll admit now, I didn't read the whole thing. I got about 40 pages in and started skimming. Then I read some other reviews of the book on Amazon, that confirmed what I had gleaned. The book seems to be solely for the purpose of venting anger at two opposing camps. Foster admits in the forward that he wrote the book out of anger. And I'll tell you, it shows in every word! He pits Creationists and evolutionists against each other, and attempts to disprove both viewpoints without actually offering an alternative. It's a constant cry of, "Both theories are too simplified to be right." Maybe so, but why get angry? The truth is, as Christians there is only one thing we have to agree on--Jesus as the Son of God. SHOULD we believe God created us? Of course. Otherwise, Jesus being the Son of God is meaningless. Do we HAVE to agree on HOW God created us? No. I personally am a Young Earth Creationist, although I feel there is a little more to the "six twenty-four-hour periods" than most YEC's are open to. There is a great book called Starlight and Time by D. Russell Humphreys that does a fabulous job of theorizing a way that the universe could have been made in billions of years and yet from the perspective of the earth it would have been six days. It's heady, yeah, and you need to have a decent understanding of physics to be able to even hope to follow it, but it's a stupendous book. It's one of many, many books I've read on the topics of Creation science and evolutionary theory. And YES, I've read books on both sides. I have a Biology degree, and I've read gobs and gobs of books on evolution--they're called text books :P. I've also read Darwin's On the Origin of Species as well as several books by Dawkins. Suffice it to say, I'm no dummy on the subject. The Selfless Gene, though, infuriated me. Foster dogs Dawkins at every turn, but writes in very much the same arrogant and condescending style as Dawkins, even to the point of name-calling. So, in the end, I decided not to finish the book. And, instead of donating it to the library as I do with many other books, this one's going in the trash. Scientific snot getting tossed like the used tissue it is. 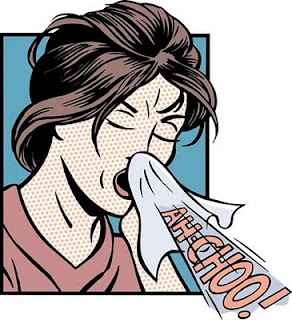 And, I suppose, since I defied the rules, this is my last "Book Sneeze." Achoo, and God bless you. LOL -- filed in the garbage. Great review. It revealed not only that I don't want to pick up this book, but it also revealed a little about you! So fun :0) Good bye Dawkins, Darwin, and Charles. Mr. Foster, I do appreciate your comment. Maybe if you had written your *book* with such a tone, rather than filling the first forty pages with anger, I would have persevered. I find it strange, though, that you say the problem is with the theistic evolutionists who think natural selection is God's way of shaping the world. The camps you attacked in the first forty pages are the ones who do NOT believe such a thing. True evolutionists believe there is no God and natural selection happens by chance. True Creationists believe we were formed perfectly, and "natural selection" acts in a negative way, almost "de-evolving" species. Yet, you spend several chapters telling both camps how inane those beliefs are. Now, you say it is the compromise between them that you were attacking? I'm sorry, too, that I wasn't able to like your book.